Russian Railways (RZD), Russia’s state monopoly operating rail cargo and passenger traffic, plans to join the infrastructure development projects in Argentina, informs TASS news agency. Following the meeting with Argentine President Mauricio Macri, who visited Moscow last week, Oleg Belozerov, RZD General Director, announced: “Today we have heard from Mr. Macri that Argentina is interested in developing our co-operation in the railway sector. I suppose in the nearest months we will sign additional documents with the view to study the projects.” According to Oleg Belozerov, these projects cover the construction and modernization of railway infrastructure and supply of modern rolling stock. Local sources say that RZD is examining the possibilities to join the construction of a railway connection to the Vaca Muerta shale gas field, which was discovered in the province of Neuquen in 2010-2011 by Argentina’s state-owned oil company YPF and is considered one of the world’s largest. 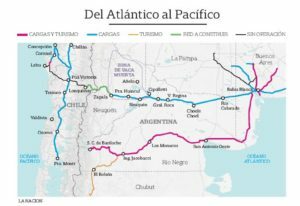 In October 2017, YPF presented to the Transport Ministry a project to build and upgrade the existing railway of a total of 700 km from the terminal at Anelo to the port of Bahia Blanca, 560 nautical miles south of Buenos Aires. According to the project, the rail traffic on the route is forecasted to reach 6 mln tonnes per year by 2030. The project is evaluated at USD 530 mln, of which USD 170 mln is to be allocated for rolling stock acquiring. The project is planned as a public-private partnership, where the federal government will provide the funding along with investors from the mining, petrochemical and rail freight sectors. This may become a part of a larger project promoted jointly by Argentina and Chile, a bi-oceanic railway corridor connecting Argentinean mining and agricultural provinces with the port of Bahia Blanca on the Atlantic coast and the Chilean port of Talcahuano on the Pacific coast. Currently, Bahia Blanca handles mostly dry bulk for export (66%) – grain, flour, malt, soya – and some oil and chemical products (30%). In 2017, its throughput reached 26.4 mln tonnes. Last year the port also started handling sand and some chemical products for the Vaca Muerta project. However, it may well be developed into an alternative for the busy Buenos Aires.